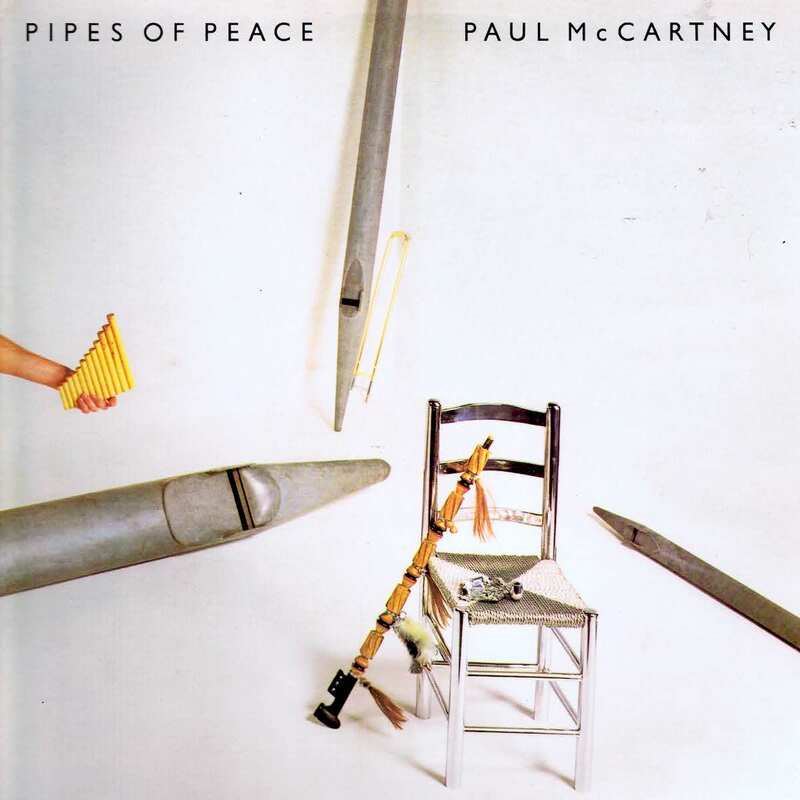 This pop rescue from a fate uncertain, is the 1983 LP Pipes Of Peace, the fourth by former-Beatles member, Paul McCartney, but should we play it loud, or is it better on mute? Let’s find out.. This George Martin (The Beatles, Cilla Black etc) produced album opens with the title track Pipes Of Peace, its own opening reminiscent of The Beatles orchestral warm ups caught on tracks like A Day In The Life. Soon though, Paul’s vocals come in with a gently plodding beat, bass, and tinkering piano, aiding to his lyrical delivery of a message promoting human and Earthly unity, with an anti-war video set in the trenches of France during Christmas 1914. This would be the second and final UK single, hitting the top of the UK singles charts in 1983. The tempo takes a welcome turn up for Say Say Say. This was the album’s lead single, allowing the album to hit the ground running with this hit #2 UK single. The track still feels as catchy and fresh as it undoubtedly was back then. Michael Jackson‘s vocals sit well alongside Paul’s, and the whole track is lent a funkier sound that wouldn’t be amiss from his Off The Wall album. It’s hard not to tap a foot to this track. This is followed by The Other Me, which possibly takes the historic title of being the only song so far to have the line “acted like a dustbin lid”. This track feels, in contrast to the previous tracks, quite simple, and it takes some time before a roaring electric guitar chugs in. Up next is Keep Under Cover, which is quite uptempo and bouncy. At times it sounds like something that you might find on a Madness album, or something that didn’t make it on the Yellow Submarine soundtrack. Side One closes with So Bad, which is a gentle ballad, which seems to be sung by Linda McCartney and Paul. Violins and cellos wash in in the later half. Lyrically it’s a bit nauseating, but it draws side one to a close just fine. This track was a top 30 single for Paul in the US. Side Two bursts opens with the second Michael Jackson collaboration, The Man. Opening with guitars and strings, and punctuated with handclaps, this song is pretty mellow to be honest, and almost feels like they’re singing about each other, and a bit of a waste of the collaboration opportunity. …Average Person. This track is laden with piano, and more familiar McCartney character narratives. This feels like it could have been a Beatles draft song, but it’s uptempo, fun, and bright, and works well here with what sounds like Ringo Starr on backing vocals. Near-instrumental Hey Hey follows this, and whilst there’s some nice funky bass, and guitar riffs throughout, it’s just filling up some vinyl space with little else to offer. The album closes with Throughout Love, a mid-tempo track that gently wanders along with strings, Paul’s soft vocals and plenty of Oohs. The song gradually builds up, almost sounding something that could could imagine Dusty Springfield or Cilla belting out in the 60s. It’s a nice ending to the album. Over all, this album is a pretty easy listen, and I can imagine it had wide appeal – with plenty for older fans in the George Martin production, Paul’s familiar vocals and narrative lyrics, and the appearance of Ringo on drums for a couple of tracks. It also had a nod to the modern, with the appearance of Michael Jackson, and what sounded like a gentle sprinkling of keyboards just to nudge it towards the electronic music fans. POP RESCUE COST: £1.25 from a British Heart Foundation store. Posted in 1980s, Michael Jackson, Paul McCartneyTagged 1983, Linda McCartney, Pipes Of Peace, Ringo Starr, Say Say SayBookmark the permalink.